As I mentioned in Part 1, "felt appliqués, card-woven bands, braided cord, and wire passimenterie" were also used to decorate Norse garments. Appliqués are easy to create from felt when you use a fusible webbing material like Wonder Under™. This material is made of paper coated with a thin layer of adhesive that melts when heat is applied. You can iron it to the back of a piece of fabric then remove the paper backing to create an iron-on appliqué. Since it is heat sensitive, it can come off in the dryer, so use a sewing machine to zig zag the edges, or embroider Viking stitches to finish the edges, and permanently sew the pieces together. Acrylic felt in tan, black, red, green, and brown. The first appliqué is a black felt spiral called a triskelion that will be embroidered with three inner spirals that I think look like sea monsters. 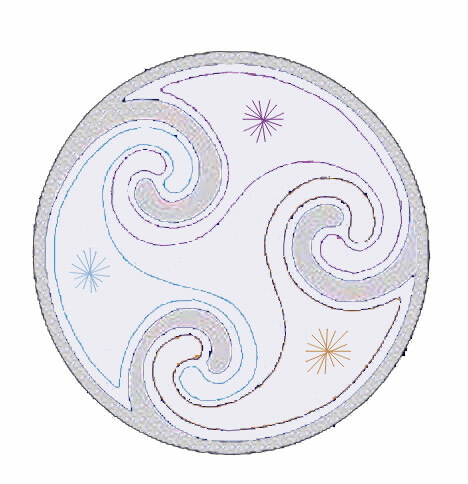 Print out the pattern, it is a reverse of the finished triskelion design. to the felt and cut out the shape. Wash, dry, and iron the garment and the felt pieces before you start your project to avoid problems created by fabrics that shrink at different rates or dyes that bleed. Use the carbon paper to trace the outline of the design onto the paper side of the fusible webbing, ignoring the lines for the embroidery for now. Cut the triskelion shape out of the fusible webbing leaving 1/4" or more excess. It doesn't have to be neat and you can leave the inner spirals uncut. 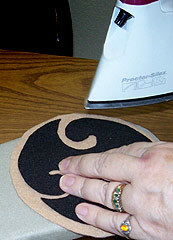 Iron it to the black felt, let it cool, then carefully cut out the triskelion on the line. for only a few seconds. Cut a larger circle from the tan felt. 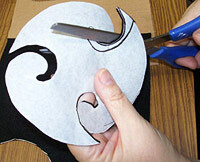 Pull the paper backing off the black felt triskelion. 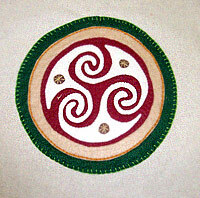 Position the triskelion on the center of the tan felt circle with the shiny webbing side down. Set your iron to medium high and press for about 5 seconds. Be careful not to heat the iron too hot or press too long or the acrylic felt could melt, too. Draw the inner spiral shapes on the black felt freehand if you wish or you can transfer the embroidery lines to the felt by pricking a dotted line through the paper pattern then rubbing white chalk dust through the holes using a cotton ball. When you embroider, stitch through both layers to secure them. design in chalk first as a guide. Embroidering Spirals: You can use Backstitch, Stem Stitch, (see part 1) Chain Stitch or Reverse Chain Stitch (see inaminuteago.com) to make the outline for the inner spirals. Embroider each inner spiral shape in a different color. Draw a circle with chalk in the center of each spiral shape for the stars. Embroider the star by poking up through the fabric in the center of the circle. For each subsequent stitch, the needle goes down into the fabric on the rim of the star a short distance from the prior stitch and comes up through the center. Continue around the rim of the star until you arrive back at the beginning. Cut a circle of fusible webbing smaller than the tan circle and position it in the center of the back of the tan felt. Press with a hot iron for 5 seconds. Allow to cool, then remove the paper backing. 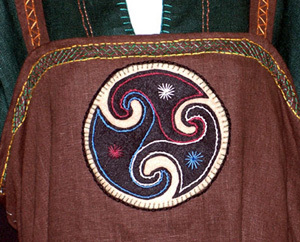 Draw a line down the center of the Inge Viking Apron Dress with chalk. Position the triskelion on the center of this line at an attractive level and press with a hot iron to adhere. and iron onto the felt. 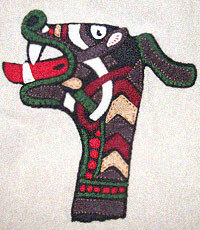 Attach the appliqué to the Inge Viking Apron Dress permanently using Blanket Stitch and black thread. To enhance the design even more, outline the the entire circle with a heavy line of Chain Stitch in black. 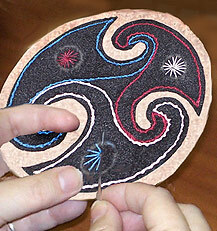 This appliqué is similar to the first project except that it is made of several different colored felt pieces that are attached to the black circle. Print out a copy of the pattern. Cut a circle from the black felt using the pattern as your guide. For this project, ignore the triskelion. Transfer the design by using carbon paper or any other method to trace the inner spiral shapes in the pattern to the paper side of the fusible webbing. Leave plenty of room around each spiral shape. Cut around each shape leaving a rough border. pieces to the black felt appliqué. 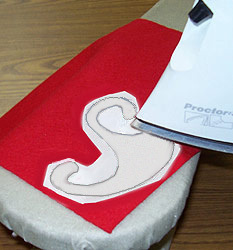 With a hot iron, press one spiral shape to the red, one to the green, and one to the brown felt. Cut the spiral shapes out carefully and remove the paper backing. Position all the spirals on the black felt circle with the shiny webbing side down. Adjust their positions until they look right and then press with a hot iron. with webbing and edge stitching. 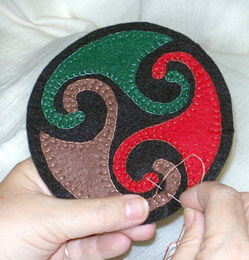 Blanket Stitch around each spiral shape using only 2 strands of red, brown, or green embroidery floss. 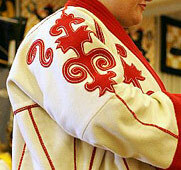 Add some embroidered stars at the junction of the spirals. When you are done, cut another smaller circle out of the fusible webbing and attach to the back of the black felt to make an iron-on appliqué. Position on the garment (in this case a Linen Half Moon Kerchief) and press with a hot iron. Stitch around the edge of the black cirlce to secure to the linen with Blanket Stitch. Alone of all re-enactment societies, Regia Anglorum owns a permanent site. Situated about sixty miles from central London and in a patch of secluded woodland near Canterbury in Kent. This Viking age re-enactment society has an amazing website filled with articles on Viking costume, culture, and crafts. If you want to add this article to your list of favorites or email it to a friend, please use this permanent URL, https://stores.renstore.com/-strse-template/0710B/Page.bok. Permission is granted by the author to quote from this page or use it in handouts as long as you include a link back to Renstore.com.